For my 5th birthday I requested carrot cake for my dessert. It's been a standby ever since. (Though I'm sorely disappointed if I ever encounter carrot cake that has raisins lurking inside!) I have to admit to loving the cream cheese frosting that is the usual accompaniment and adds to my all-around love of the cake. 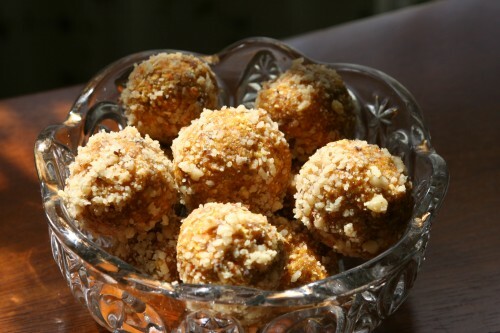 It's been months, maybe even a couple of years since I've eaten a slice of my beloved carrot cake, so I was intrigued by this recipe for raw carrot cake balls I stumbled across on Pinterest. These are cream cheese frosting free, but I still thought worth sampling. finely chopped walnuts for rolling, opt. Rough chop the dates and walnuts and then put them in a food processor fitted with the chopping blade. Process until date pieces are about the size of raisins. Add the oats and process until the oats are ground. Add grated carrot, lemon zest, vanilla, cinnamon, ginger, and salt and process until the ‘dough’ comes together in a ball. If it seems a little dry, add a few drops of water and process again. Use clean hands to form into balls. Roll in chopped walnuts, if desired and store in the fridge. Makes 12-15 balls. Nice and tasty recipe. Thanks for sharing! internet has brought ordering pizza to a new level. Their style of toppings is what makes the pizzas delicious.